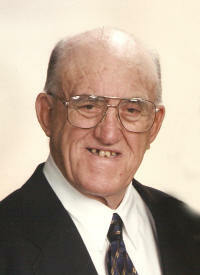 Severin E. Emig, 86, of Trenton, died Wednesday, September 23, 2009 at Aviston Countryside Manor. Mr. Emig was born August 27, 1923 in Trenton, IL to Elmer and Mary (Bugger) Emig; they preceded him in death. He married Marie Hercules on April 29, 1950 at St. Anthony of Padua in St. Louis; she preceded him in death on September 9, 2005. Also preceded in death by a son, Robert Emig; a daughter, Mary Emig; a sister, Marie Helldoerfer; brothers, Wilfred Emig and Oliver Emig; sisters-in-law, Bernadine Emig and Mary Hercules; and brothers-in-law, Aloysius Helldoerfer, Robert Hercules, and Albert Hercules. Surviving are his children, Kathleen Emig of Trenton, Mary Frances (Dennis) Hoerner of Trenton, Darlene Emig of Trenton, Severin J. “Sonny” (Julie) Emig of Highland, Joseph Emig of Trenton, Jerome (Diane) Emig of Trenton, Diane (Kevin) Hoffmann of Beaver Creek, OH, Eugene (Debra) Emig of Trenton, Lisa (David) Hawk of Ballwin, MO, and Michael (Tracy) Emig of Trenton; 23 Grandchildren and 2 Great-Grandchildren; a brother, Gualberd (Clara) Emig of Trenton; a sister-in-law, Regina Emig of Bartelso; and a brother-in-law, Joseph Hercules of St. Louis, MO. Severin formerly drove a concrete truck for Meyer Concrete in Trenton and retired as a life-long farmer. He was a member of St. Mary Catholic Church and Holy Name in Trenton, Clinton County Farm Bureau, Catholic Family Services, and was the last remaining chartmer member of the Trenton Knights of Columbus Council 2932. Funeral Mass of Christian Burial will be Saturday, September 26, 2009 at 10:00 AM at St. Mary Catholic Church in Trenton with Fr. Eugene Kreher officiating. Interment will follow in St. Mary Cemetery, Trenton. Visitation will be Friday, September 25, 2009 from 4:00-9:00 PM and again on Saturday, September 26, 2009 from 8:00-9:45 AM at the Moss Funeral Home in Trenton. The Trenton K of C will hold services at 8:00 PM Friday evening at the funeral home. Memorials can be made to St. Mary Church and will be received at the funeral home.